ebook PDF (129 pages, 1.89 MB), Kindle (mobi), etc. 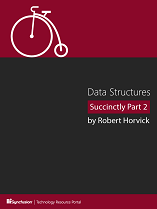 Data Structures Succinctly Part 2 is your concise guide to skip lists, hash tables, heaps, priority queues, AVL trees, and B-trees. As with the first book, you'll learn how the structures behave, how to interact with them, and their performance limitations. Starting with skip lists and hash tables, and then moving to complex AVL trees and B-trees, author Robert Horvick explains what each structure's methods and classes are, the algorithms behind them, and what is necessary to keep them valid. The book also features downloadable code samples and vivid diagrams to help you visualize the more abstract concepts, like node height and node rotations.